Fees: Cash advances either $5 or 3% of the amount of each cash advance, whichever is greater. 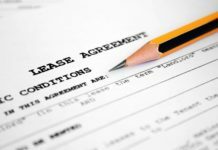 Terms and Conditions Apply: For rates and fees of the Hilton Honors American Express Business Card, please visit this rates and fees page. The Hilton Honors American Express Business Card is a premium hotel rewards credit card with a fantastic welcome offer and a slew of attractive perks for frequent business travelers. Every eligible dollar spent with this card earns Hilton Honors bonus points redeemable at more than 4,000 Hilton and partner hotel and resort properties worldwide. That’s on top of the Honors base points earned on every eligible Hilton purchase. Other notable benefits include automatic Hilton Honors Gold status, up to two weekend reward nights for heavier spenders, and complimentary Priority Pass™ Select membership – your ticket to more than 1,000 airport lounges worldwide. Read on to learn more about this card’s features, benefits, drawbacks, and overall suitability. Earn 125,000 Hilton Honors bonus points when you spend at least $3,000 in eligible purchases within the first 3 months of cardmembership. That’s good for up to 25 free nights at Hilton’s lowest-tier properties. Every $1 you spend at Hilton properties or partner hotels and resorts earns an unlimited 12 Hilton Honors points. Every $1 you spend on select business and travel purchases, including airfare booked directly with airlines and U.S. restaurant purchases, earns an unlimited 6 points. All other purchases earn an unlimited 3 points per $1 spent. You can redeem your points for free hotel nights, starting at a minimum of 5,000 points for Category 1 hotels. Hilton’s Points & Money Rewards™ feature lets you combine points and cash in 1,000-point increments, starting at a minimum of 5,000 points. Per-night redemption rates vary with demand, seasonality, and other factors. The number of points required for redemption increases with hotel category and generally ranges from 5,000 to 95,000 per night, depending on the property and season. As long as you remain a cardholder in good standing, you’re automatically granted Gold status in Hilton’s loyalty program. Gold status boosts your point earnings on Hilton and partner property stays by 25%. On rewards stays of five nights or longer, you’ll get a fifth night free. Other perks include free in-room Wi-Fi and free room upgrades where available. Check with Hilton for additional perks and benefits. When you spend at least $40,000 in eligible purchases on your card during a calendar year, you’ll automatically earn Diamond status through the end of the following calendar year. Diamond status entitles you to a 50% bonus on all base point earnings and guaranteed 48-hour availability at all participating Hilton properties – meaning you’ll never be sold out of your preferred hotel when you book at least 48 hours in advance. Lower-status benefits all apply too. When you spend at least $15,000 in purchases on your card within a calendar year, you earn a complimentary weekend night reward – a free night’s stay at participating Hilton properties. You’ll qualify for another complimentary weekend night reward when you spend an additional $45,000 in purchases on your card within a calendar year ($60,000 total calendar year spending). That’s a total of two possible weekend night rewards each year. Check with Hilton for participating properties and other restrictions. As long as your account remains open and in good standing, you qualify for complimentary Priority Pass™ Select membership. This entitles you to up to 10 complimentary visits to more than 1,000 Priority Pass airport lounges around the world. Though admission fees and amenities vary by lounge, this perk is easily worth hundreds of dollars when fully exploited. The annual fee is $95. There is no foreign transaction fee. Cash advances both cost the greater of $5 or 3%. Terms and conditions apply. For rates and fees of the Hilton Honors American Express Business Card, please visit this rates and fees page. This card’s regular APR ranges from 17.99% to 26.99% variable, depending on your creditworthiness and prevailing interest rates. Fantastic Welcome Offer. The Hilton Honors Business Card’s welcome offer is extremely generous. It promises 125,000 bonus Honors points – good for up to 25 free nights at the lowest-tier Hilton properties – with just $3,000 in eligible spending within the first 3 months of cardmembership. Great Rewards Rate on Hilton Purchases. Eligible Hilton hotel and resort purchases earn 12 points per $1 spent, meaning you can qualify for a Category 1 reward night with as little as $417 in purchases at participating properties. Generous Rewards Rate for General Business and Travel Spending. This card earns 6 points per $1 spent on certain business and travel spending purchases, including U.S. restaurants, airfare purchased directly with the airline or AmexTravel.com, and car rentals booked directly with select car rental companies. This makes it a great vehicle for saving money at restaurants and reducing the cost of international business travel. Automatic Gold Status for Cardholders in Good Stead. As long as your account remains open and in good standing, you’ll enjoy complimentary Gold status in the Hilton Honors program. As a Gold member, you’re entitled to a slew of convenient and cost-effective perks, such as a 25% bonus on base point earnings and a fifth night free on qualifying reward stays. Complimentary Weekend Nights for Heavy Spenders. Although it does require a fair bit of spending, you can earn up to two complimentary weekend nights each year with this card. You need to spend at least $15,000 in eligible purchases within a calendar year to qualify for your first complimentary night, and $60,000 in a calendar year to qualify for your second. Complimentary Priority Pass™ Select Membership. As long as your account remains open and in good standing, you enjoy complimentary Priority Pass™ Select membership. This entitles you to 10 free visits to more than 1,000 Priority Pass lounges worldwide – 10 sorely needed spells of rejuvenation amid the hustle and bustle of the airport. Measured against the full price of each airport lounge pass, this benefit is worth $300 or more. No Foreign Transaction Fee. This card has no foreign transaction fee. That’s great news for jet-setting business travelers who spend freely outside the United States. Some other American Express business cards charge 2.7% on foreign transactions. Has an Annual Fee. Hilton Honors Business has a $95 annual fee. That’s a drawback relative to some competing hotel rewards cards. 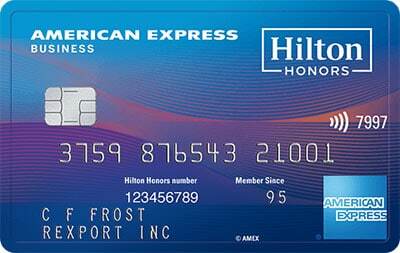 The Hilton Honors Card from American Express, a consumer card with comparable benefits, has no annual fee. Onerous Spending Requirements for Weekend Night Rewards. You need to spend at least $15,000 in a calendar year to qualify for your first weekend night reward, and four times that amount to earn your second. Low-spending business travelers aren’t likely to clear $60,000 in eligible spending within any calendar year. Even $15,000 is a heavy lift for occasional road warriors. Relatively Low Redemption Value. With exceptions, Honors points are generally worth less than $0.01 apiece at redemption. This compares unfavorably to some other hospitality brands’ loyalty currencies. If you’re looking for a business travel card with super-favorable redemption values, consider applying for the Marriott Bonvoy Business™ American Express® Card. The Hilton Honors American Express Business Card is a travel rewards credit card for serious business travelers who don’t mind spending the lion’s share of their hospitality allowances at Hilton hotels and resorts. Its fantastic, easy-to-attain welcome offer and above-average rewards rate on Hilton spending are great for moderate spenders. The complimentary weekend night rewards sweeten the deal for heavier spenders with enough flexibility to stick around into Saturday or Sunday. And complimentary Priority Pass™ Select membership is awesome for all. As long as you can spend enough to make the $95 annual fee worthwhile and find enough reasons to stay at Hilton properties for business throughout the year, this card is worth keeping in your wallet. For rates and fees of the Hilton Honors American Express Business Card, please visit this rates and fees page. The Hilton Honors American Express Business Card is an excellent choice for business travelers who frequently stay at Hilton hotels and resorts. With luxe perks, such as 10 complimentary airport lounge visits after Priority Pass™ Select enrollment and complimentary Gold status from Hilton Honors, this card helps you travel in style – no matter where you happen to be. Fantastic welcome offer, excellent rewards rate, weekend night rewards, airport lounge perks, and complimentary Gold status are all great. The annual fee and high spend requirement for the second weekend night are problematic. Overall, a strong choice for Hilton-friendly business travelers.